This title is directed primarily towards health care professionals outside of the United States. 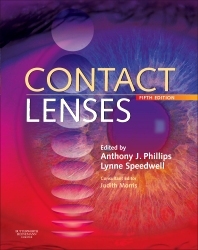 Completely updated and revised, this classic text provides a definitive reference work on contact lenses for optometrists, dispensing opticians, ophthalmologists and contact lens practitioners. An everyday definitive reference work, this classic, beautifully designed text has been reinvented to provide the modern eye care practitioner with all the essential knowledge that they need in one volume.